Color(s): Black, red, yellow, golden. The Goldador is created by the crossing of two breeds: Golden Retriever and Labrador Retreiver. They are typically referred to as a "designer dog". 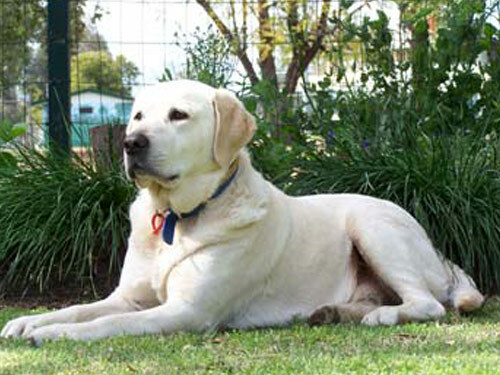 The most popular Goldadors are those resulting from first generation crosses. Muscular and sturdy, the Goldador is well-proportioned and of medium size. They are athletic, hardy, and agile. They exhibit a pleasing personality and kindly expression. The Goldador is affectionate, loyal, and loving. They are extremely family oriented and do not do well if left alone for extended periods of time. They will become destructive if bored or lonely. Goldador's are well-suited for homes with children, dogs, and other household pets. They make good watchdogs that will alert their family to visitors and out of the ordinary sounds. The Goldador may also be dominant and is typically exuberant. Regular brushing with a firm bristle brush is recommended to remove loose and dead hair for the Goldador. Bathing should only be done when absolutely necessary using a mild shampoo. It is important to regularly check and clean the ears. They may be prone to such health issues as ear infection, hip dysplasia, PRA, heart problems, and Von Willebrand's Disease. The Goldador has a double coat. The outer coat is short, hard, and water-resistant. The under coat is soft and dense. Early socialization and obedience is recommended. The Goldador is sensitive and intelligent. They will not respond to harsh or heavy-handed methods. Training must be done with firmness, fairness, patience, and consistency. The Goldador is highly active and requires an inordinate amount of physical exercise and mental stimulation. They do best in a suburban or rural setting where there is ample secure space to roam and run. Goldador's enjoy family activities, swimming, and long, brisk walks.